With a Safe Cell, you can easily set up a protected space in your home. 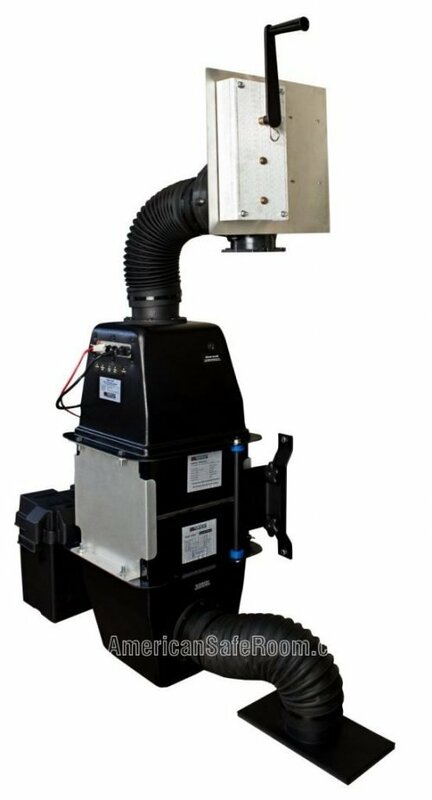 It is a specialized wide spectrum air filtration system designed to bring air into a protected space, filter it, and expel it into the room with more pressure than the air pressure outside. This “overpressure” ensures that all of the air in the room is flowing outward through any leaks. This outward flowing air prevents unfiltered toxic air from entering the protected space. 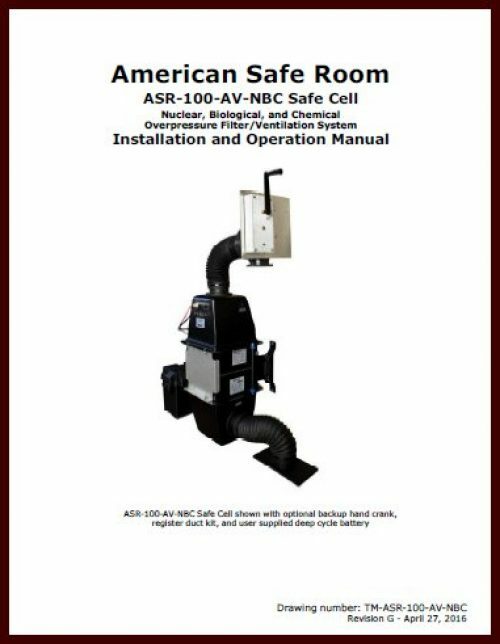 Every Safe Cell comes with a comprehensive installation manual (PDF) and many accessories are available. In a Class 1 Safe Room, air is drawn from outside the room, filtered, and discharged inside the room at a rate sufficient to produce an internal pressure. The safe room is thus ventilated with filtered air, eliminating the constraints related to carbon dioxide accumulation. 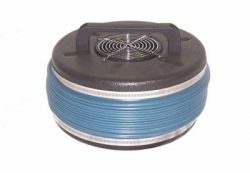 The internal pressure produced with filtered air prevents infiltration of outside air through leakage paths. 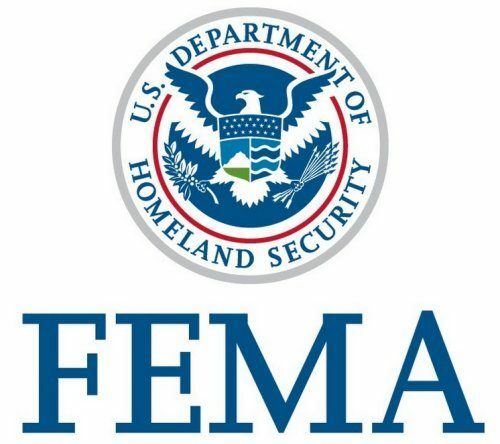 Here are the critical parts of the air filtration section of this document and here is the full text (PDF) from FEMA’s website. The Safe Cell draws outside air through two pre-filters and a nuclear grade HEPA filter, removing the radioactive fallout and other particulates. Then the air is drawn through a bed of tightly packed granulated carbon where the radioactive iodine and other true gases are adsorbed. The Safe Cell features 95% NUK-TK carbon that is optimized for the removal of radioactive iodine. What makes radioactive gases and small particulates so deadly is that they are inhaled into the soft tissues of the lungs where they are trapped while they decay. This means that 100% of the radiation they give off is impacting the vital organs in the chest cavity. This is much more dangerous than an external radiation source. For more information on the filters and carbon we used in the Safe Cell, see the Filter Testing and Certifications page. The Safe Cell is easily mounted in a home or apartment. 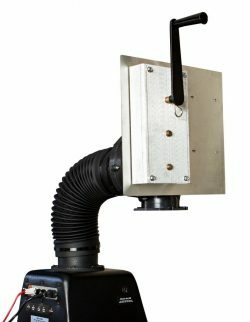 It attaches to a wall with a mounting bracket. 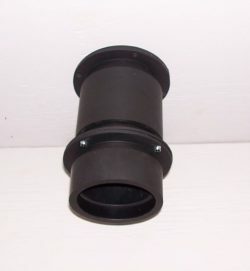 You can draw air from the outside through a four inch diameter pipe through the wall or from a register duct with the optional duct adapter. See the manual for detailed installation instructions. Most homes have enough air leaks to exhaust the air back outside, but if your protected space is sealed up tight, you might need an overpressure valve over another four inch pipe. You must bring in oxygen and exhaust the carbon dioxide to sustain life. 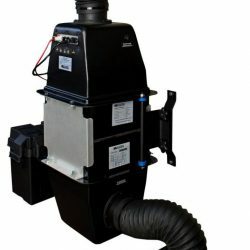 This kit allows you to draw air from an HVAC or heat pump floor register. 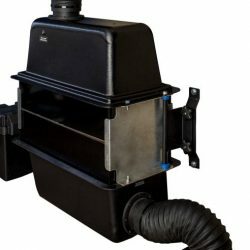 The intake hose from the Safe Cell slips right on the cover plate that attaches to the register without tools. This is a secondary backup after the battery backup system built into the Safe Cell. If the grid goes down for an extended time and you have no way of recharging your battery, this hand crank will allow you to stay sheltered in place. This is a secondary backup after the battery backup system built into the Safe Cell. If the grid goes down for an extended time and you have no way of recharging your battery, this hand pump will allow you to stay sheltered in place. The overpressure valve is a one way check valve used to exhaust the air from your protected space. It allows air to go out, but it will not allow unfiltered air to back up into your protected space. It also helps the Safe Cell to maintain overpressure by give a slight back pressure to the airflow. The Safe Cell is an overpressure filtration system that draws air from the outside and introduces it into your protected space with enough airflow to create positive pressure. This overpressure keeps all air flowing outward through any small leak points so no airborne toxins can migrate in. 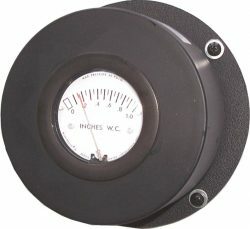 This gauge shows the difference in pressure between your protected space and the outside. Every Safe Cell installation should have at least one reload of spare filters. After the nuclear accident in Fukushima Japan in 2011, we were out of filters in two days even though we can only ship the Safe Cell to end users in the United States. When there is a nuclear event anywhere in the world, every NBC filter manufacturer will probably be out of stock in short order. 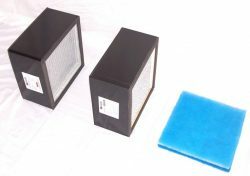 The time to get your replacement filters is when you order your Safe Cell! Contact our sales department and get your Safe Cell on the way! The Safe Cell ships by UPS Ground in unmarked boxes.